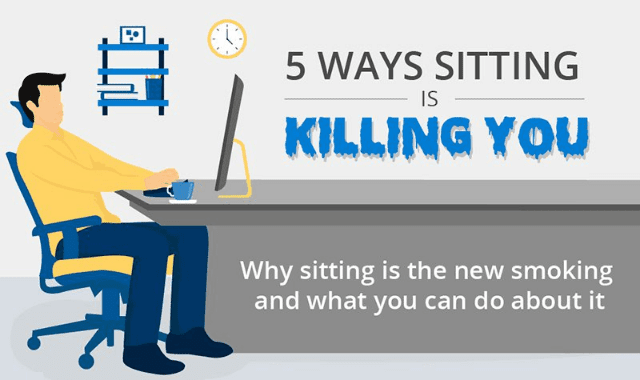 5 Ways Sitting is Killing You #Infographic ~ Visualistan '+g+"
Find out why sitting is the new smoking and what you can do about it for better health and wellness. GeekWrapped.com’s science team has summarized the top five reasons why sitting is unhealthy. It increases our chance of dying early, makes us fat, increases the risk of depression, harms our bodies, and is detrimental even if we exercise. Learn how to improve your lifestyle for positive health and wellness benefits by sitting smarter, standing more often, tracking your activity, doing a simple yoga move, and more. Protect your health with these simply tips.